Awardpedia - "Grace" Red Glass Christmas Tree Topper. "Grace" Red Glass Christmas Tree Topper. 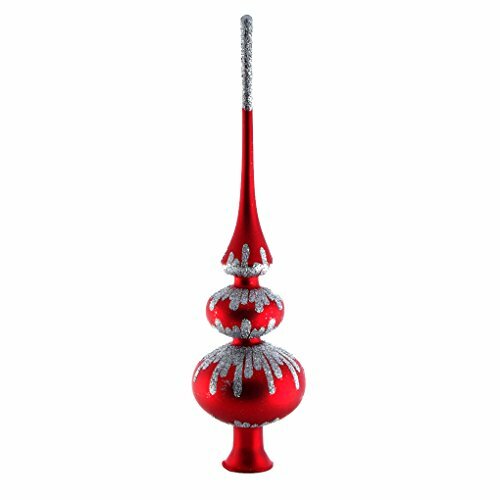 The bright red matte surface of 10.5" (270 mm) glass Christmas tree finial called "Grace" has a simple design of using silver glitter as if it were cascading down from one section to the sections below. This "dripping" effect creates an appearance of liquid glitter. The very top of this Christmas tree finial sparkles as it is also encrusted with shiny glitter. Artists use same painting technique that was used in 1800's. Each topper is painted individually which makes them unique and adds some small variations to each product in height and bottom opening. Weight: 0.8 - 1 oz. Bottom opening varies from 0.5" to 0.8". Height: 10.5'' (270 mm). Made in Russia.